Kid Rock did a short tour of clubs (as opposed to the amphitheaters he’s been playing for the last umpteen years) with a bunch of the proceeds going to his CARE foundation, supporting various charities in the various cities the tour hit. Buffalo was one of the cities chosen for the tour, and needless to say, it wasn’t the easiest ticket to get, but get one I did. While I’ve always loosely remained a Kid Rock fan, I hadn’t seen him since before he really blew up, that being Warped Tour 1998 and then at Water Street in March of 1999, right before Bawitdaba was released as a single. Anyway, fandom came full circle seeing him in a little place again! Opener Ty Stone was just a dude and an acoustic guitar, but he sounded pretty good. 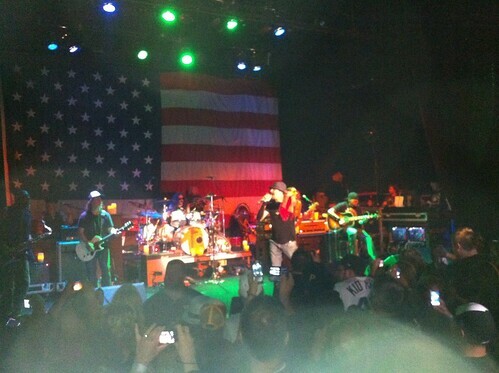 After much crowd anticipation, Kid Rock and the band came out, and started old-school with Devil Without a Cause. There was a decent mix between old and new songs throughout the set, and it was pretty easy to see that the crowd was singing along with everything. They were into it all night, not surprising considering that only the diehards would go through the trouble to get the tickets. Made for a fun night, and I think Kid Rock himself had a blast on this tour in general, let alone our stop, being able to actually see everyone in the crowd and interact with them. I certainly came away with a newfound appreciation for him and his band after this one.